Howard Leight by Honeywell AirSoft Reusable Ear Plugs With Carry Case (NRR 27)5MOE-DMay 21, 2013Very nice can keep clean and reuse!!! Very durable!! Keeps noise out best used yet!! Howard Leight by Honeywell AirSoft Reusable Ear Plugs With Carry Case (NRR 27)4Ed TomkoMay 9, 2013does the job great...the flanges could be a little larger in diameter but otherwise perfect. Howard Leight by Honeywell AirSoft Reusable Ear Plugs With Carry Case (NRR 27)5Stephen RobertsMarch 26, 2013Great product that can be washed and reused. 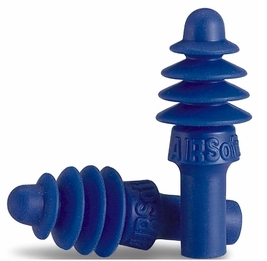 The noise suppression is excellent for a hard plastic ear plug. I use them in addition to ear muffs for chain saws and snow blowers and alone for vacuums etc..
Howard Leight by Honeywell AirSoft Reusable Ear Plugs With Carry Case (NRR 27)2AnthonyDecember 28, 2012These ear plugs are way too hard and not soft as their name implies. Found them to be painful to insert and keep in place for more than several minutes. The only attribute is that once fully inserted they provide excellent noise protection. Will be looking for a softer ear plug from your product line. Howard Leight by Honeywell AirSoft Reusable Ear Plugs With Carry Case (NRR 27)5DeborahSeptember 9, 2012First used when issued at new employment. Tried the foam but was not satisfied. Purchased several with case and love them. Plugs are the best and case makes nightly storage easy & easy to maintain. Have shared with co-workers. Two thumbs up from all. Thanks. Howard Leight by Honeywell AirSoft Reusable Ear Plugs With Carry Case (NRR 27)5Helen PowellAugust 26, 2012These orange ear plugs were great. I have a small ear canal, and if I wet the inside of my ear just a little, they slide right in. I especially like the fact I can control how much noise I hear with them. They drown out dog barking, snoring and TV. Proper insertion is the key. Howard Leight by Honeywell AirSoft Reusable Ear Plugs With Carry Case (NRR 27)5Bill HansonNovember 30, 2011Good quality, seem to hold and and are stiff enough in the center for me to properly insert in my ears. Highly recommended. Howard Leight by Honeywell AirSoft Reusable Ear Plugs With Carry Case (NRR 27)5Paul WilcoxsonJuly 31, 2011These ear plugs are first rate and are in their own case making them easy to carry. Howard Leight by Honeywell AirSoft Reusable Ear Plugs With Carry Case (NRR 27)5BobJuly 15, 2011My wife and I both used these plugs one with a small canal other a medium. Good sound protection while shooting. Comfortable and easy to use. Would gladly recommend. Howard Leight by Honeywell AirSoft Reusable Ear Plugs With Carry Case (NRR 27)4VicJanuary 28, 2011These work well for me as I have smaller ear canals where other ear plugs are very uncomfortable because either they are bigger in diameter or are made of stiffer plastic.